For children facing serious illnesses like cancer, the treatment process can be scary because of the physical pain. But now thanks to a new grant, one local treatment center has a high-tech way to help ease their pain. Cure 4 The Kids is a nonprofit clinic that treats children with serious medical conditions including cancer. 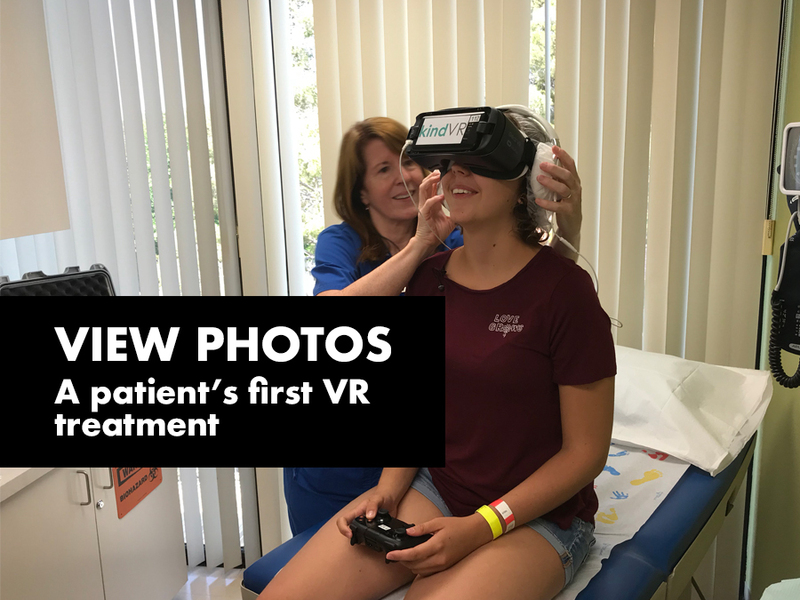 Thanks to a grant written in part by neuropsychologist Dr. Danielle Bello, the clinic has just received 3 sets of virtual reality goggles. The VR goggles are made by KindVR and the experiences are designed to help distract children and ease their pain while undergoing treatment. Since being diagnosed with leukemia, Serena Everest has been to Cure 4 the Kids, a nonprofit specialty clinic, dozens of times. Taking her blood, though, has never gone so smoothly. Probably because she's distracted from the pain thanks to some new, grant-funded, virtual reality headsets. "This is going to help a lot of kids that we've sort of scratched our heads on how can we help them," said Sue Waltermeyer, a child life specialist at Cure 4 the Kids. No one wants to watch a child in pain. It slows down life-saving treatment and hurts a parent's heart. Handing the control over to the kids might be a game changer. "Sometimes I'll be walking through the hallways to my room and it will kind of scare me because I hear like kids crying and screaming and that kind of stresses me out and makes me more tense and I have anxiety so it just kind of puts me on edge, and now that I have this to distract me it kind of takes that edge off," said Everest after her first treatment with the virtual reality headset. There are several different virtual reality experiences. Some are tailored for certain procedures to ensure the doctors can do their thing without getting in the way of the fun. Here's a preview of what it looks like. In this game, viewers go under the sea to find creatures and treasure. The objects turn different colors when bubbles are shot at them using a game controller button and the user controls the direction by turning their head.